You must have the latest version of MoveIt! installed. On ROS Melodic you will need to build MoveIt! from source. A build from source is required as STOMP is not part of the official release yet. It is therefore not included in the binary packages. We will go through the steps for doing this below. To use STOMP with your robot you must already have a MoveIt! configuration package for your robot already. For example, if you have a Panda robot, it’s probably called panda_moveit_config. This is typically built using the MoveIt! Setup Assistant. You must also have built ros-industrial/industrial_moveit package from source. This needs to be built from source since industrial_moveit is not released as a debian yet. You only need to build the stomp_core package from industrial_moveit as other packages are not required for the functionality of STOMP with moveIt. Now follow the instructions on the MoveIt! homepage for installing MoveIt! Melodic from source. Note that you can skip the Prerequisites section since you should already have a Catkin workspace. Note: if you are following this demo using the panda_moveit_config from the ros-planning/panda_moveit_config repository, these steps are already done for you and you can skip steps 1-3 and you only need to do step 4. Adjust the line <rosparam command="load" file="$(find panda_moveit_config)/config/stomp_planning.yaml" /> to <rosparam command="load" file="$(find <robot_moveit_config>)/config/stomp_planning.yaml" /> replacing <robot_moveit_config> with the name of your MoveIt! configuration package. Download stomp_planning.yaml file into the config directory of your MoveIt! config package. In our case, we will save this file in the panda_moveit_config/config directory. Create the “stomp_planning.yaml” configuration file. This file contains the parameters required by STOMP. The parameters are specific to each ‘’planning group’’ defined in the SRDF file. So if there are three planning groups, then the configuration file defines a specific set of parameters for each planning group. In our case there is only one planning group, i.e., the “panda_arm”. > Save this file in the config directory of the moveit_config package. Also make sure that the dimensionality of the stddev array parameter is the same as the number of joints present in the planning group name of your robot. This scripts creates a cluttered scene with four ostacles or a simple scene with one obstacle depending on the argument given to the script. One can also change the position/size of the obstacles to change the scene. 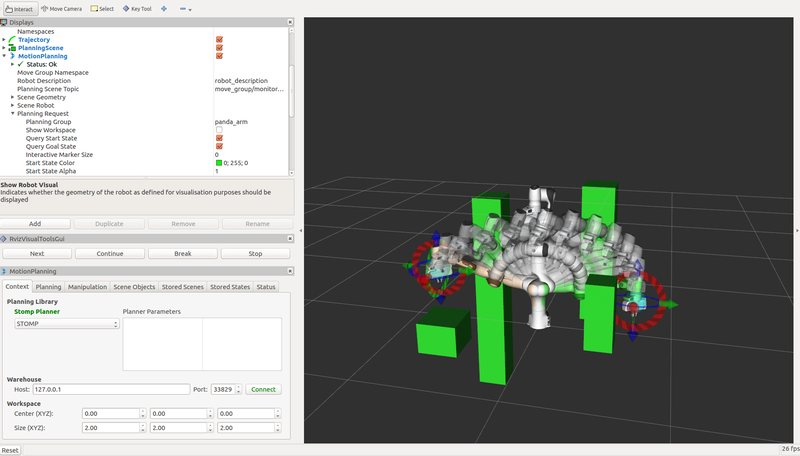 Next, in RViz, select STOMP in the MotionPlanning pannel under the Context tab. Set the desired start and goal states by moving the end-effector around with the imarker and then click on the Plan button under the Planning tab in the MotionPlanning pannel to start planning. The planner will now attempt to find a feasible solution between the given start and end position. STOMP performs better than CHOMP in avoiding obstacles. This is due to STOMP’s stochastic nature which produces non-jerky trajectories as opposed to CHOMP which often produces jerky paths to avoid obstacles. num_timesteps: the number of timesteps the optimizer can take to find a solution before terminating. num_iterations: this is the number of iterations that the planner can take to find a good solution while optimization. num_iterations_after_valid: maximum iterations to be performed after a valid path has been found. num_rollouts: this is the number of noisy trajectories. max_rollouts: the combined number of new and old rollouts during each iteration should not exceed this value. initialization method: this is the initialization method chosen to select the means to initialize the trajectory. control_cost_weight: this is the percentage of the trajectory accelerations cost to be applied in the total cost calculation. class: this can be set to “NormalDistributionSampling” (default) or “GoalGuidedMultivariateGaussian”. Depending on what class is used specific parameters need to be set. Have a look at this link for setting parameters if using the “GoalGuidedMultivariateGaussian”. stddev: this is the degree of noise that can be applied to the joints. Each value in this array is the amplitude of the noise applied to the joint at that position in the array. For instace, the leftmost value in the array will be the value used to set the noise of the first joint of the robot (panda_joint1 in our case). The dimensionality of this array should be equal to the number of joints in the planning group name. Larger “stddev” values correspond to larger motions of the joints. class: here you can set the cost function you want to use. You could set this to “CollisionCheck”, “ObstacleDistanceGradient” or “ToolGoalPose”. Depending on what you put here, you need to set the appropriate cost function class’s parameters: For “CollisionCheck”, you need to set the parameters (collision_penalty, cost_weight, kernel_window_percentage, longest_valid_joint_nove); for “ObstacleDistanceGradient”, you should set the parameters (cost_weight, max_distance, longest_valid_joint_move) and for “ToolGoalPose”, you should set the parameters (constrained_dofs, position_error_range, orientation_error_range, position_cost_weight, orientation_cost_weight). Have a look at this link for setting parameters for “ToolGoalPose” class. collision_penalty: this is the value assigned to a collision state. kernel_window_percentage: the multiplicative factor used to compute the window_size for doing kernel smoothing. longest_valid_joint_move: this parameter indicates how far can a joint move in between consecutive trajectory points. class: this can be set to “PolynomialSmoother” or “ConstrainedCartesianGoal”. Specific paramters need to be set depending on the chosen class. For setting parameters for “ConstrainedCartesianGoal”, have a look at this link. poly_order: this is the order of the polynomial function used for smoothing trajectories. Choosing parameters for STOMP requires lesser intuition than CHOMP. One can have the default parameters for STOMP and this works well in most environments. However you could increase the number of timesteps, number of rollouts and play around with the stddev array for STOMP to perform well under complicated environments so that STOMP can find an optimal path in these situations. Alternatively you can try different cost functions, noise generators, update filter classes by setting whichever ones you want in the stomp_config.yaml file. Local Minima Handling: STOMP can avoid local minima due to its stochastic nature. CHOMP however is prone to and gets often stuck in local minima, thereby avoiding an optimal solution. As per the STOMP and CHOMP papers, STOMP performs better. CHOMP however due to its gradient based nature gets stuck in local minima and is often not able to find solution or returns sub-optimal solutions. Time requirements: the execution times are comparable, even though CHOMP requires more iterations to achieve success than STOMP. This is mainly because each iteration of STOMP requires multiple trajectory cost evaluations, but can make larger steps in a more stable fashion than the CHOMP gradient update rule. OMPL algorithms are efficient and usually find a solution quickly. Parameter tuning: CHOMP generally requires additional parameter tuning than STOMP to obtain a successful solution. OMPL does not require a lot of parameter tuning, the default parameters do a good job in most situations. Obstacle Handling: For scenes containing obstacles, STOMP often is able to successfully avoid obstacles due to its stochastic nature. CHOMP however generates paths which do not prefer smooth trajectories by addition of some noise (ridge_factor) in the cost function for the dynamical quantities of the robot (like acceleration, velocity). OMPL also generates collision free smooth paths in the presence of obstacles.